The process of applying watercolor tattoo uses the same procedure as regular tattoos. The only significant difference is in the appearance of the brushstrokes. The tattoo artist aims to achieve a wispy feel to the artwork. 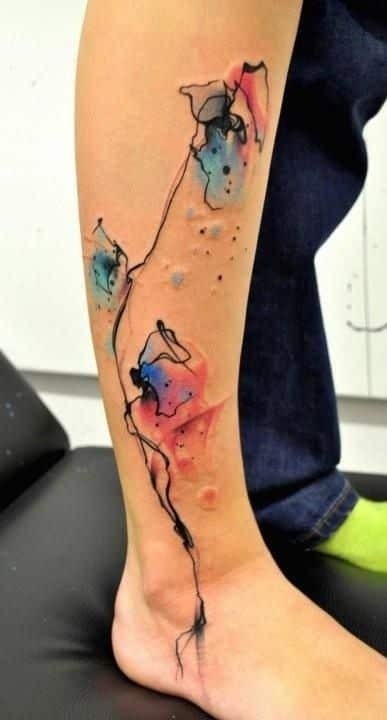 Watercolor tattoos look like drippings and splatters of paint. The way it’s intricately made screams for attention. Men from all over the world have fallen in love with this modern trend. It is a very hip, chic and fashion forward way of expressing one’s style. It looks unusual in a good way and it makes men feel more attractive. The main concern regarding these beautiful watercolor tattoos is if they will last for a long time. They are achieved by coloring outside the lines instead of inside them which is the usual way of tattoo application. Some people also question whether the pain is worth the whimsical inspiration of these one of a kind creations. The truth is that no matter what type of tattoo you get, you will need to have touch ups at some point. Even if your tattoos were made with the cleanest outlines, touch ups are essential if you want to keep them looking fresh. Watercolor tattoos represent a loud statement of originality. They continue to be well loved by men from all over the world. The best part about getting one is that no two designs are exactly the same. However, before making the commitment to put something permanent on your body it’s always best to do some research first. This way you can decide for yourself whether its beauty is worth the pain. Looking for various designs online and in magazines is a great source of inspiration. It will help you determine if you want to make the personal investment. Once you have decided that you can commit to it, find an artist who is capable of appreciating the design you want. It’s also extremely important that the artist has the appropriate skills to execute the best results. There are plenty of artists you can choose from who have become popular and have made a name for themselves in this amazing new area. 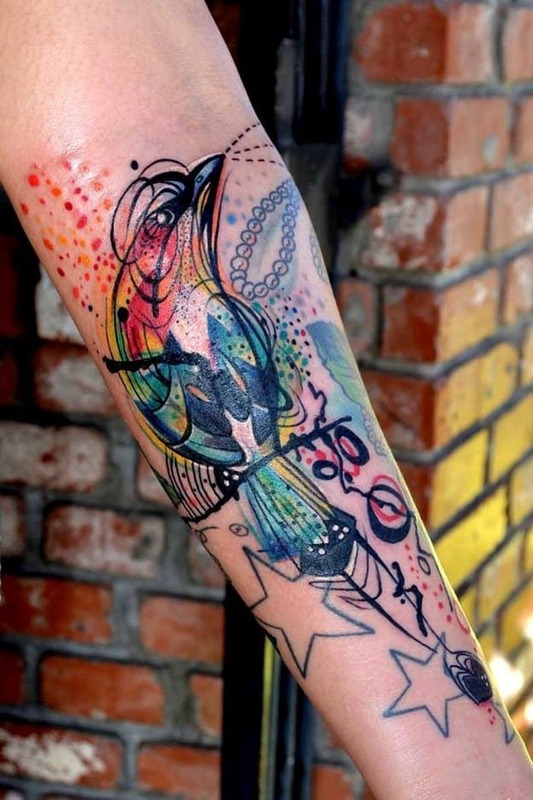 In this spectacular arm tattoo we can see how the artist has used minimal strokes along with vivid colors, the tattoo is of a kingfisher bird that is about to pounce on its prey. 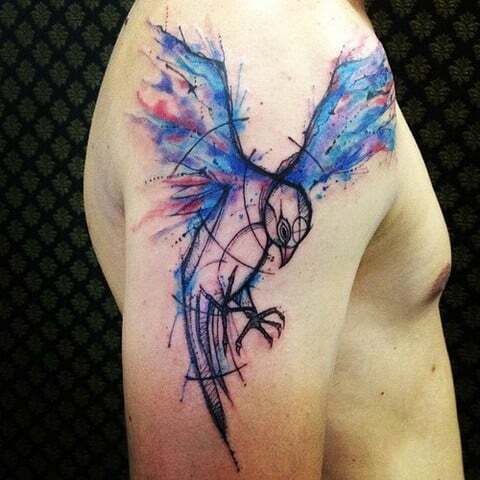 The bird is literally outlined with only black ink but the wings have been made with a multicolored theme which gives it a truly surreal look. This watercolor themed tattoo is a bird which has been decorated with abstract designs, here we see how a simple tattoo is made interesting by adding some additional decorations in the background like colored speckles, stars, and a pearl necklace. Here the artist has made a truly unique minimal watercolor tattoo using very few colors, the tattoo is a minimal themed plant with three flowers. The flowers are inked with a loose outline so that the color can be shown overflowing, the shading effects used in this tattoo adds to its overall appeal. 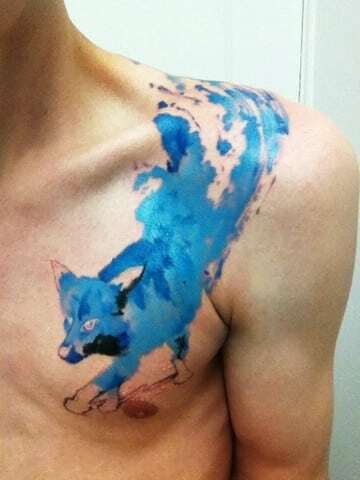 A brilliant watercolor tattoos idea made with amazing details, in this tattoo we see a blue colored fox on the upper chest. The fox is fading off into smoke toward the end of its body, the watercolor theme is adding to the appeal of the tattoo and the fading effect blends perfectly with the art. 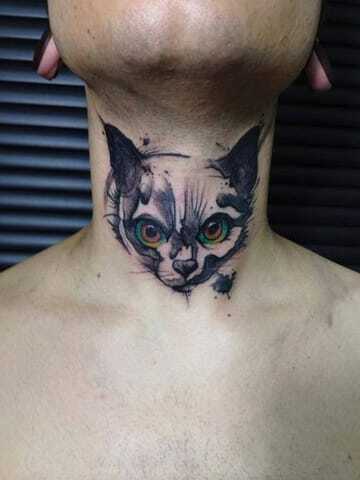 A one of a kind tattoo made on the front of the neck, here we have a uniquely made head of an evil cat which has been inked in black with a few colors to add effect to the eyes. The artist has paid attention to small details like the whiskers, the shadowing effects and emotions portrayed. A highly detailed watercolor tattoo design that makes great used of colors, here we see a tattoo of a heart made with immense detail. Each artery of the heart is visible along with high-end shadowing effects and realistic veins. 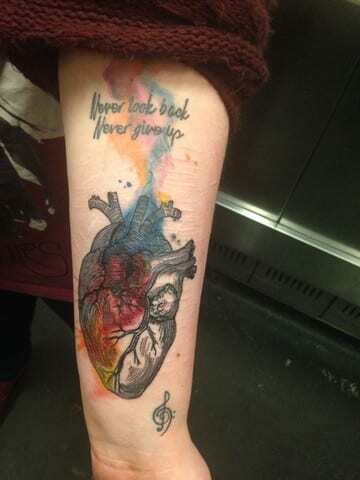 it also has the phrase “Never look back, Never give up” inked right above the heart with rainbow colored smoke rising from it. 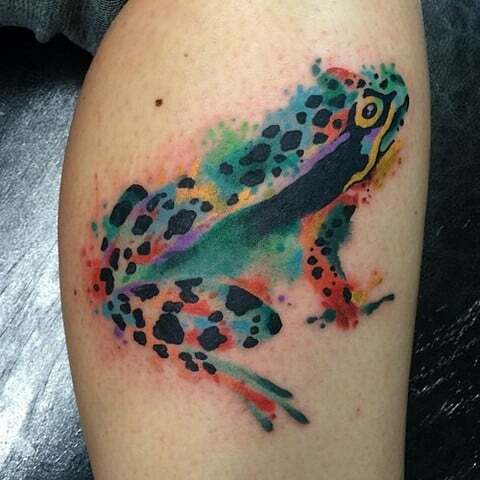 A truly genius tattoo idea that uses the watercolor theme to create a truly unique frog, this tattoo has a multicolored frog which has been made with speckled spots and brilliant watercolors smudges that give it a realistic look. The artist has managed to make it look truly surreal with the choice of colors and the details. 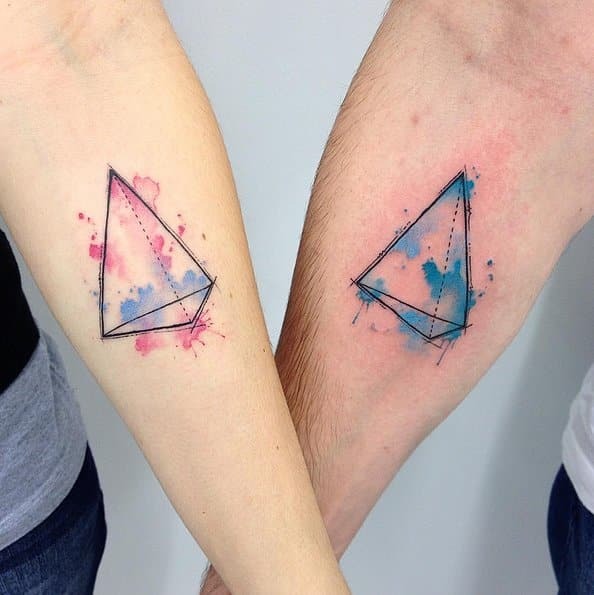 Triangular shapes have been a popular tattoo idea for a long time, here we see how the artist has a simple and identical tattoo for a couple. The simply outlined triangles are shaded with smudges of pink color for the female and in smudges of blue for men. 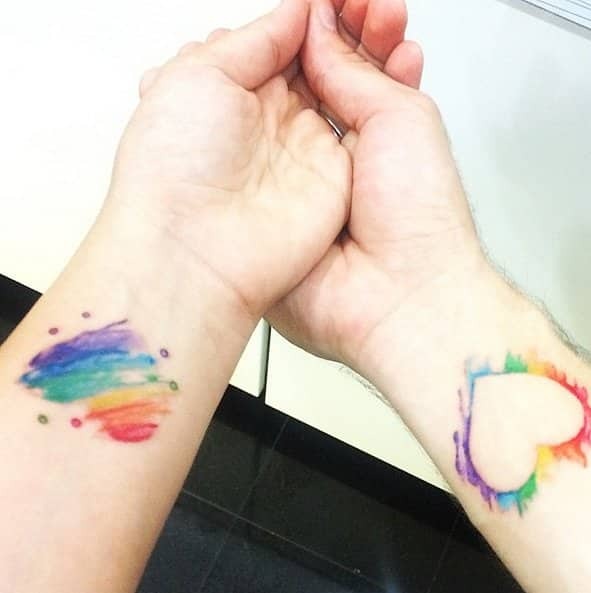 A minimal watercolor tattoo design of rainbow hearts inked on the forearms, on the left hand there is only a shady image of a heart without any outline and the right hand has a heart which seems to be flaming with a rainbow colored outline. It’s great for people who want a sober and cool tattoo idea. 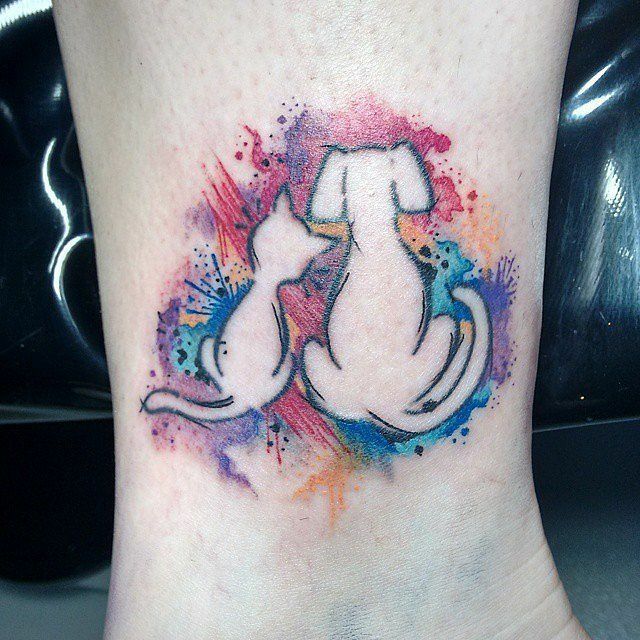 A truly meaningful minimal tattoo made in a watercolored theme, here we see an outline of a dog and a cat getting together which is quite uncommon to see. The tattoo is outlined with multicolored smudges and splatters to add to the emotion of the art, it is great for people who can relate to it.